The City of Angels is cut by a river of concrete. For most of its 50-mile course, the Los Angeles River is trapped in a cement channel, walled off behind chain link fences and barbed wire. We've been working to free the "Once and Future River" for more than 20 years, pitching in to grow the Los Angeles River Greenway, a strand of parks that welcome Angelenos back to the river's banks. Today, we're working to build a new park at the confluence of the Los Angeles River and Aliso Creek. This two-acre nature park will eventually join the existing greenway via a new pedestrian bridge over Aliso Creek and more than a mile of new bike trails. The park and greenways will also absorb and filter stormwater, reducing flood risk and improving water quality. More than 9,000 people live within a ten-minute walk of the new park. 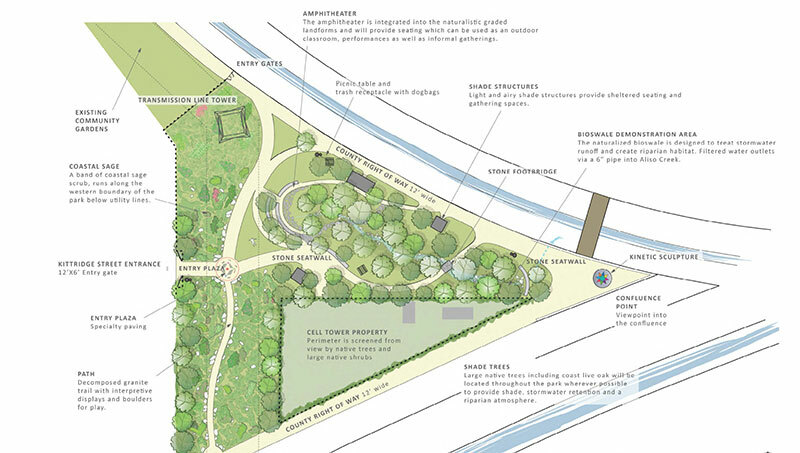 When it opens in summer 2016, residents of the San Fernando Valley will have safer access to a green place to play, and a new connection to their river. This project is made possible through strong local partnerships and support, including the County of Los Angeles Department of Public Works, City of Los Angeles Department of Recreation and Parks, City of Los Angeles Department of Water & Power, Councilmember Bob Blumenfield, LA Riverworks, the Reseda Neighborhood Council, Revitalize Reseda, and many others.